5th May, Macau: Korea and Japan shared the glory in the concluding 22nd East Asian Pacific Tenpin Bowling Championship Park Min Su of Korea and Kanako Ishimine of Japan won the Men's and Women's Masters gold medals. Doubles Gold medalist, Park Min Su, who finished top-seed after a convincing 3831 over two blocks of the 16-game round-robin Masters finals to bag the gold medal for Korea after defeating challenger, Masaaki Takemoto of Japan, 413-403 in the stepladder finals. Park had built up a 32 pins margin in the first match with 211 over Takemoto's 179 and despite putting a strong rally in the second match with 224, the Japanese failed to beat the Korean, who posted 202. In the first match between second-seed, Jarrod Lean of Australia and Takemoto, the runner-up edged the Aussie in a lowly, 182-164 to set up the final against Park. Jarrod had led the first block with a 1973 and was 73 pins ahead of the Korean but disappointing second block of 1744 and managing only 4 wins in the matchplay, settled for the bronze medal. Despite dropping to third in the second block with 3725, Takemoto won the bronze medal. Yoshinao Masatoki did well to move up from sixth in the first block to end up in fourth with 3726 but missing the cut for the stepladder finals. Korea almost celebrated a double when Team gold medalist, Lee Yeon Ji was beated by Singles and All Events Gold medalist, Kanako Ishimine of Japan, 361-454 in the Women's stepladder finals. The top-seed lost both the matched 182, 179 to Ishimine's 226, 228 and was denied the victory. Third-seed, Park Hye Min was outclassed in the first match by the the Japanese when Ishimine posted 201 to Park's 154 to set up a showdown with another Korean. Australia, who was participating in this championship for the first time, finished third overall with 4 gold, 1 silver and 1 bronze medal. 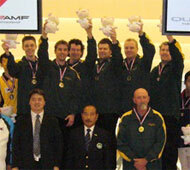 Australia did however emerged Men's champion with 25 points while Japan also emerged Women's champion with 40 points. A total of 8 countries participated in this year's championship which is an Asian Ranking tournament. 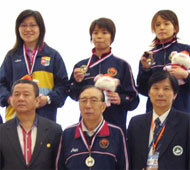 Photos courtesy of Macau Bowling Association. 3rd May, Macau: Australia bagged two gold medals when their men triumphed in the Team and Trios event while Korea added one more gold by winning the Women's Team and Japan winning the Women's Trios. The gold medal winning trio of Jason Walsh, Jarrod Lean and Michael Little of Australia, teamed up with Mac Stewart and Brian Pilkington (alternated by Glen Loader) over two blocks of 3 games to amassed a total of 6554 to bag third gold medal in the Team of 5 event. Korea's Gang Yu Chan, Eom Young Hyun, Koo Seong Hoi (alternated by Park Keun Saem), Kim Sik, Park Min Su settled for second and the silver medal with 6490, 64 pins adrift the Australians. Japan's Toshihiko Takahashi, Masaaki Takemoto, Tomoyuki Sasaki, Shoji Kawada (alternated by Yoshinao Masatoki) and Tomokatsu Yamashita took home the bronze with 6308. China missed the medal finishing fourth with 6262 with Chinese Taipei ending up in fifth despite being in the hunt in the first block. Australia won their second gold in the Men's Trios event after totaling 4183 ahead of Guam, who won their first medal after four days of competition. Joey Miranda III, Keith Guerrero and Jay Leon Guerrero amassed 4066 to win the silver medal. Japan's Toshihiko Takahashi, Shoji Kawada and Tomokatsu Yamashita settled for the bronze medal with 4042, just 24 pins adrift Guam. Jarrod Lean captured Australia's fourth gold medal in the competition after finishing top of the All Events standings with 5649 from 24 games competed in the Singles (1418), Doubles (1390), Trios (1480) and Team (1361). Park Min Su won the silver medal with 5491 while Kim Sik of Korea settled for the bronze medal with 5399 pinfalls. Korea, who failed to win a gold medal after four days, finally struck by capturing the Women's Team event with a total of 6405. Lee Yeon Ji, Lee Jae Ok, Choi Ji Su (alternated by Kim Hye Young), Kang Gyeong Mi and Park Hye Min finished 162 pins ahead of the Japanese women. 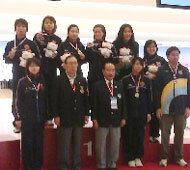 Haruka Matsuda, Maki Nakano, Mihoro Kawamura, Kanako Ishimine and Kumi Tsuzawa totaled 6243 to settle for the silver medal. Chinese Taipei, who has yet to win a gold medal, finished third to take home the bronze medal with 5946. Japan's Haruka Matsuda, Kanako Ishimine and Kumi Tsuzawa had earlier snatched the Women's Trios gold medal from the Koreans by just 34 pins on a total of 3915. Park Hye Min, Kang Gyeong Mi and Lee Yeon Ji settled for the silver with 3881. 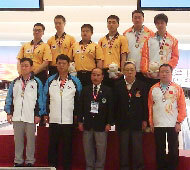 China won their second medal in the competition with another bronze medal when Zhang Yu Hong, Chen Dong Dong and Xu Lan totaled 3609 to finish third. Korea's other trio of Lee Jae Ok, Choi Ji Su and Kim Hye Young took fourth spot with 3535. Meanwhile, Singles gold medalist, Kanako Ishimine won her second individual gold and her third after finishing top in the All Events standings with 5507. Haruka Matsuda gave Japan a 1-2 finish by taking the silver medal with 5224. Korea's Lee Yeon Ji settled for the bronze with 5151. The top 16 in the both the Men's and Women's All Events standings made the cut for the Masters finals which will be contested over two blocks of 8 games round-robin matchplay format on 4th and 5th May. The top 3 will proceed to the stepladder finals. 1st May, Macau: Japan and Korea shared the glory on Day 2 of the 22nd East Asian Pacific Tenpin Bowling Championship as Japan finished 1-2 in the Women's Doubles while Korea took the gold and silver in the Men's division. Haruka Matsuda and Maki Nakano totaled 2730 to win Japan's second gold medal in the competition. Matsuda knocked down the highest 6-game series with 1441 with teammate, Nakano contributing 1289 for the victory. Singles gold and bronze medalist, Kanako Ishimine and Kumi Tsuzawa gave Japan a double celebration when the pair finished second to win the silver medal with 2640. Ishimine chalked up 1326 while Tsuzawa downed 1314. Singles silver medalist, Vanessa Fung partnering Sylvia Kong gave Hong Kong the bronze medal when the duo posted 2560, 79 pins ahead of the Korean pair of Park Hye-Min and Kim Hye Young in fourth spot on a total of 2551. After drawing blank on Day 1, another Asian bowling powerhouse came back with a vengence when Gang Yu-Chan and Park Min-Su outclassed the field to capture their first gold medal in the Men's Doubles with 2821. Gang posted 1395 with Park providing a higher 6-game series of 1426 to emerge victorious. Eom Young-Hyun and Kim Sik gave Korea a 1-2 finish when the Korean pair totaled 2733 to win the silver medal. China's Ling Jia and Gong Cheng snatched the bronze medal from Guam with a superb 505 total in the final game. The Chinese pair totaled 2713, just 4 pins ahead of Guam's Keith Guerrero and Jay Leon Guerrero on 2709. After two events, Jarrod Lean of Australia led the All Events standings with 2808 from 12-games followed by Park Min-Su of Korea second and JD Castro of Guam third with 2760 and 2729 respectively. Kanako Ishimine of Japan topped the Women's standings with 2805 ahead of Hong Kong's Vanessa Fung in second with 2671 and Kumi Tsuzawa of Japan third with 2599. Japan also led the Medal Tally with 2 gold, 1 silver and 2 bronze medals with Korea and Australia tieing in second with 1 gold and 1 silver medal each. 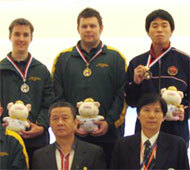 30th April, Macau: Australia dominated the Men's Singles of the 22nd East Asian Pacific Tenpin Bowling Championship with Micahel Little and Jarrod Lean finishing 1-2 while Japan's Kanako Ishimine took the Women's Singles gold. This year's East Asian competition included the Pacific for the first time and Australia, the powerhouse in tenpin bowlng, proved their strength by capturing the gold and silver medal of the Men's Singles event on the first day of the championship. Michael Little, who won the Masters gold in the 2003 World Championship, set a scintillating pace with 653 in the first 3-game series to take command of the field 48 men. The Aussie then knocked down 278 to further stretch his lead. Another high game of 289 saw the Little sealing the victory with 1437 to give Australia their first-ever gold medal in the championship. Fellow-compatriot, Jarrod Lean, who also posted two massive games of 288 in the third and 268 in the final game, finished second to take the silver with 1418. Japan's Tomoyuki Sasaki did well to post 1405 to win the bronze medal while Hong Kong's Cyrus Cheung was a bit unlucky to finish fourth with 1368 and missing the medal. Japan had earlier won the first gold medal of the championsip when Kanako Ishimine outclassed the field of 36 women after cruising to a comfortable victory in the Women's Singles with 1479. 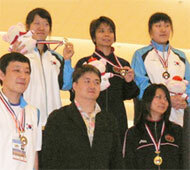 Newly-crowned Kuwait Open champion, Vanessa Fung of Hong Kong took home the silver medal with 1355, 124 pins adrift. Ishimine's teammate, Kumi Tsuzawa snatched the bronze medal with 1285 while Korea's Lee Yeon Ji missed the medal finsing fourth with 1247.